I've just recently started reading this series and although I'm only on Burned I think that this book and series keeps getting better and better! Ok so I think the good points in this book would have to be all the suspense in it. This book keeps you wanting to see what happens next, this book isn't even close to boring they always have a new adventure or problem to keep you reading on. I would say that this book is most likely one of the best in the whole series! In this book, its very suspenseful, not only does it make you want to flip the page not knowing what's going to happen, but it makes it very unique because so many people are after just one person which is Zoey, and she's got the 5 elements, so shes especially special, and Zoey and the woman A-ya have a connection, but Neferet freed the evil Kalona which is twice as bad as Neferet. Kalona has come to claim Zoey as his, she goes through a lot and her grandma gets hurt because of one of Kalona's sons, but not only she has so much on her mind, if i were her, I'd be spinning! First of all, she has to deal with her enemies. Second of all, she has to take care of her '3' boyfriends which eventually, she has none. Third of all, she has to take care of the red fledglings, which her best friend has become because of evil Neferet. Though things have been hard on Zoey, she always seems to find a way out to every wall. Therefore, I absolutely LOVED this book, and i look forward reading the next book. Okay so basically, the House of Night has become the series that I can not get enough of. I find myself immediately picking up the next book of the series after each finish. I just finished Hunted, and I cant believe what an incredible book it was. Zoey Redbird has so much to go through, and for being a teenager, I am amazed she gets through it. Throughout the book, I wasn't sure whether to hate Kalona or to fall in love with him. I completely see how the fledglings were under his spell. He was described so flawlessly. And then James Stark came along. Wow, I instantly fell in love with this one. He was perfect, after choosing good of course(: Okay is it just me, or has the admiration for Heath disappeared? I was kind of sick of him. And there was almost a sigh of relief when he died. I mean, don't get me wrong, he was amazing. But, there was something about him that just made me not want him around anymore(Maybe it's the fact that I've fallen in love with Stark, and with Heath no longer in the picture, Zoey and Stark can be together. Haha) Kay, so I'm sooo glad Zoey dumped Erik. He was getting annoyingly clingy and jealous. The ending was so intense. I about died when I thought that Stark was on the bad side, and almost killed. But, everyone worked so well together, and it really was a happy ending. I can't wait to see what High Priestess, Zoey does next!!! So now zoey knows for sure that neferet is the bad one and not the good one! and she made a man named kalona come back from being stuck underground! he makes everyone love him if you look directly into his eyes. now zoey and her friends and the other new group are hiding underground until they can figure out what to do next...Ends up that zoey needs help or a nun and her grandma and in the end they cast their circle and they run off kalona. But they just ran him off! they didnt kill him...So im hoping that there is going to be another book!! this was my favorite out of the whole series! one of my most favorite books. i recieved this book for easter and i was estatic. the wait for this book was unbering. i had to keep myself ocupied to keep from going crazy. when i recieved the book i breezed through it and it did not disapiont. i love this book and will read it many more times to come. i hope you also enjoy thos exalent novel. In the newest novel in the House of Night series, the Casts deliver another laughable story of Zoey, the young vampyre. Always struggling with her love life, Zoey goes through yet another novel with this theme as the House of Night is being torn apart by evil. Yes, this is a novel that, if you can't get past the obvious realization that this is completely fake and cheesy, many will not enjoy. For me, I have fallen in love with the characters from the other books and continuing with the series is something that I need to do in order to find out who ends up with who in the end, but, if this book hadn't been part of the series, I never would have read it. Readers be warned for more of Zoey's non-swearing words and long moments of struggling over which of the many guys she will finally want in the end. This book had funny parts to it, as well as serious. At times, the twists were crafted very well. The characters continued to develop their emotions and feelings, as well as themselves as a whole, except for Zoey who is, as always, hopelessly lost. It is this characteristic that leads her to be the lead of the story and makes her similar to readers, though her situations are highly extreme compared to what the average teens go through. A comical novel with a confusing end, "Hunted" leaves the readers of the series waiting for more, and the rest of humanity confused. Get on with it, already!!!! 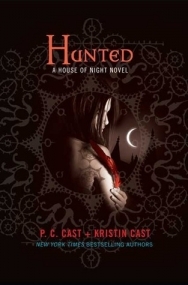 Hunted it the fifth installment in the House of Night Series. All of the other installments had a certain pace that pulled you in and kept you reading until the end. Hunted, however, missed the mark on several levels. First of all, Zoey, our main character, seems to have some weird dysfunction of becoming more annoying and immature as we go along. A main character with the powerful gifts that she has should be maturing and growing. She is becoming the biggest whining, dramatic, immature, indecisive teenager in the entire book. I understand that teenagers typically have certain issues and levels of maturity (as do adults), but the author is creating a character that I would rather see be gobbled up by some phantom Ravenmocker instead of hearing her moan, gripe and kiss every boy that shows interest. This leads to my next issue, the love triangle is becoming played out. It's ridiculous. We are moving nowhere with these people. It is borderline soap opera, circa 1981. Yes, I understand that she is supposed to be a teenager and yadda yadda. She is always so concerned with being a ho! Um, doesn't kissing and leading 3 boys on amount to some sort of ho qualities?? I think so! It's exhausting and it keeps happening over and over in each book!! With pretty much the same guys! GRRRR!!! Which leads to yet another issue. The book is 75% repetition. The same storylines and dialogue are recycled. It's almost the same, from start to finish. Zoey and the nerd herd are in trouble (GASP! ), Zoey is injured (GASP! ), Zoey has boys flocking her and she can't decide which one she wants (GASP! ), and so forth and so forth (DOUBLE GASP!!). The fans and readers want this go somewhere!! I couldn't keep count of how many times the Kalona story was given. Good gravy! Then I have to point out the text and dialogue. I can understand some certain level of eye rolling for an adult to be reading a young adult novel, but this is more along the lines of, covering my eyes hoping that it will go away! I know several gay men/boys and I believe that they would be very offended by the representation these boys are getting in this series! We know they are gay. We know they are a couple. Odds are, most of the readers have been reading this series since book one and we know this! I'm not sure if gay men should be offended or the readers, for the writers to think we are so ignorant to not understand. We are not idiots. Even if you were new to the series, it would not take a brain surgeon to figure out that these boys are gay. Don't keep repeating it! They might as well ditch the boys' names and just say, "Gay Guy 1 and Gay Guy 2!" It's offensive! Then the dialogue, oh my. I sometimes have to wonder if these teens are vampyres or if in some plot twist they are really ROBOTS! Come on!! I really, really want to love this series. It has such a great premise and I really do enjoy the parts that aren't recycled. I do enjoy it, I keep reading! I used to adore Zoey and her friends. I'm just finding that I keep getting disappointed in them. I just want these characters to develop. I want the STORY to develop. I am starting to think that I may be just a sucker for buying these little installments. Maybe I am in some sort of marketing scheme. Maybe having 3, 4, 5, 10! books in the series is just a way for them to make more money. They throw us a crumb and when we think that they are going to give us another one, they put the whole loaf away! Just tease us and fluff up the mediocre story with repetition. Rather than focus on getting the next book out in the series, maybe they should try writing a better quality book with more depth. Instead of four books, maybe combine it into ONE! I don't know, maybe more plot? I would gladly wait longer. It just really gripes me that I have been waiting all these months, just to read about two more days in the life of Zoey Redbird. Two more days that sound like the two days before and two before that. Until what?? That's the problem! I am starting to fear that this story will have no big pay off in the end. I don't want to continue to waste my time on 200 pages of recycled storylines and the grand finale just fizzle into nothing and I will be out ten bucks or more per book! Now that's an expensive let down!